Marc Chagall believed in painting from the heart and that’s what he did! 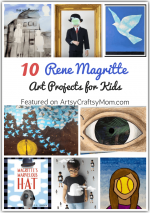 Learn more about this amazing artist with 10 Marc Chagall Art Projects for Kids. Just reading the quote above will give you an insight about the famous modern artist, Marc Chagall. Chagall was born the eldest of nine siblings in a Jewish family in early Russia. He then went on to spend several years in France and the United States, but his heart always belonged home. His fierce loyalty is visible in the way he married his fiancee in spite of the years of separation between them, and in the way elements of his culture find their way into his work. Chagall lived through many tumultuous times, like the Russian revolution, both World Wars, the German oppression of the Jews and more. Yet, he was an optimist and happy person from the bottom of his heart, and it was easy to see this reflected in his work. Chagall’s work featured cubism, surrealism, fauvism and other art movements, but he disliked being limited to labels of any kind. This affinity for variety also extended to the kinds of media he used in his art – painting, stained glass, murals, ceramic and even book illustrations. Chagall’s work have a certain ‘dream-like’ quality to them. Characters are often seen floating around, and some elements appear out of proportion. Chagall is also known for his beautiful use of colors. In fact, Picasso, who lived near Chagall, once said, “Chagall will be the only painter left who understands what color really is.” The whimsical nature of his work will appeal to kids, and his life also teaches valuable qualities like loyalty, love and staying strong and positive in the face of difficulties. 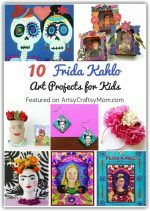 Let’s learn more about this amazing artist with these Marc Chagall Art Projects for Kids! If you look at a few of Chagall’s paintings, you can notice that he doesn’t really ‘ground’ his subjects in the usual sense of the word. They are often found on random surfaces, and never seem to be really rooted to one spot. 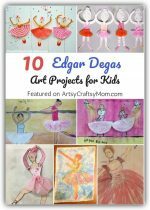 This art project from Art Curator for Kids helps kids recreate this ethereal feeling in a fun technique of using three sides of a sheet as bases. Let the kids turn the paper around as they draw, for some truly Chagall-inspired work! Like we mentioned earlier, Chagall could never forget the village he grew up in, the landscapes, the people and the innocent pleasures of his childhood. These were common themes in his work, a famous example of which is ‘I and the Village’. This painting features elements from his childhood and folk stories, a lovely concept that kids can emulate in this art project by Kinder Art. Marc Chagall painted a lot of houses – ‘The Red House’, ‘Street in the Village’, ‘The Blue House’, ‘Burning House’ were just some of them. They were probably derived from memories of the houses on the streets of Vitebsk. 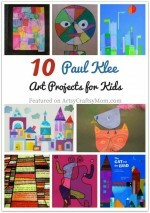 Teach Kids Art has an interesting project for oil pastel houses inspired by Chagall. Don’t forget to add whimsy, out of scale elements like flying dogs or fish climbing trees! The Peace Window was a piece of art created by Chagall for the United Nations to honor the previous Secretary General of the UN. The window is a large piece of work and is situated in the visitor’s lobby of the United Nations building. The original artwork has several biblical motifs, but Art in Action Toronto shows us a simplified collage based on this artwork that’s easy enough for little kids to try! This is a lovely book that talks about Chagall’s life, with lots of pictures featuring Chagall’s work. The book tells us about Chagall’s humble beginnings, his journey across countries through various world conflicts and how he finally got all the fame and fortune he deserved. This is a great book for kids of all ages. When Chagall first came to Paris, he didn’t know the language and was terribly home sick for his native Russia. But he soon grew to love the city, its air and in particular the Eiffel Tower. His work, ‘Paris from the Window’, reflects this growing appreciation for the city of light. Mary Making has a fun project based on this painting that involves sponge and acrylic painting along with collage elements like poster board and photos. Chagall liked painting about new beginnings, which explains why many of his paintings feature newly married couples, sunrises and – roosters! Yes, roosters are a recurring theme in Chagall’s work, and Se7en has used this in their embellished rooster project. This is a great project for young kids and you can use all kinds of mixed media to make your rooster as colorful as possible. We absolutely love this artist rendition featured by Mrs. Specter! A group of children come together to recreate Chagall’s iconic ‘floating’ style – in such a fun way! You can do this with many of Chagall’s paintings, since large faces are a common component of many of his paintings. Chagall worked on a large number of stained glass art projects, particularly towards the mid to latter part of his career. Most of these works reflected religious or biblical themes, as he compared reading the Bible to perceiving light through a window. 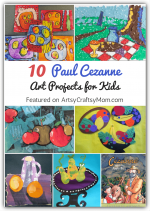 Kim Weissenborn has a gorgeous stained glass project based on Chagall’s work that’s a great idea for older kids. With so many fun and whimsical themes, coloring pages based on Chagall’s work are perfect for little ones to fill in. Super Coloring Pages has a collection of free printable sheets based on Chagall’s most iconic works, like The Green Violinist, The Walk and Over Vitebsk. 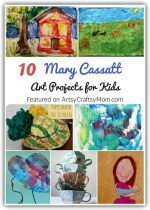 Exploring this amazing artist’s work is easier by going through these Marc Chagall art projects from kids. Chagall was a man who believed in painting from the heart. That’s why his paintings reflect those things that were dearest to him – his childhood, his village in Vitebsk, his beloved Bella, the Bible and music. He said, “If I create from the heart, nearly everything works; if from the head, almost nothing.” We can’t think of a better way to create either! Where to find the link, how to buy the files for these projects on artists please? Are they suitable for 5/6 year olds?